This week every short term trader has been mesmerized by one question which had Bulls and Bears still wondering which way this market will break…up or down. 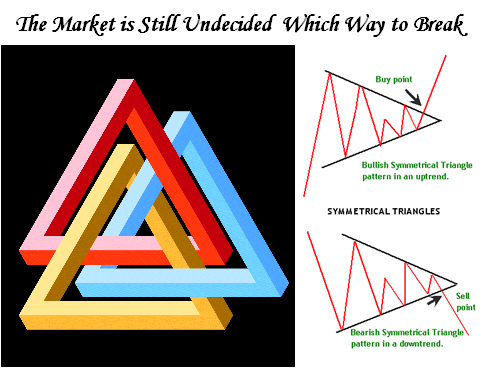 As part of their repertoire of tools rhey had the old favorite of Technical Analysis Symmetrical Triangles as the center of attention. As the headline above says, it is once again Nail-Biting Time for Round #3 at the OK Corral to stay with the theme I set in an earlier blog. Last week I showed you my assessment as we have watched the saga from February 8 to 15 and Now Feb 22. Victory was snatched one more time from the Jaws of the Bears where with only about half-an-hour to go to the close on Friday, just like clockwork there was a surprise EVENT relating to bailing MBIA out of their Credit Loan Crunch problems. That news drove the Dow up over 100 points and the Nasdaq about 40 points and left a long spidery leg with a Hammer for the day. Technical Analysts were licking their chops that at least the decision on which way the market was headed was down, but at the close the question of which way next week is still in the balance. However, this is the fourth Friday in a row where it has closed up…net, net we do not have conviction one way or another to drive this Market with explosion to the upside or to the downside. If it breaks to the upside we drive for 2540 and if to the downside, we retest the Base Low at 2203. The good stuff on Symmetrical Triangles is still intact for yet another T/A element to watch for next week. Unless there is again some follow through tangible information that breaks early next week on this subject to continue to drive the Bears to cover their shorts and possibly force the pattern to the upside, the odds still favor a move to the downside with Lower Highs and Lower Lows. 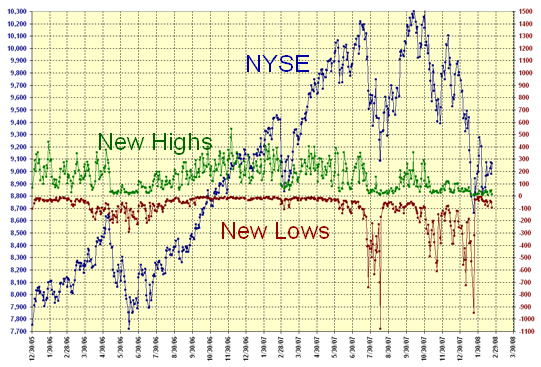 The bias to the downside is reflected by the number of NYSE New Highs being only 15 and New Lows 97 on Friday…not good. The weakness to the upside is exacerbated by the fact that since December 27 we have not had a single day with more than 68 New Highs over 57 trading days. From past readings of failed rallies in Bear Markets, the longest that the rally has held is 18 trading days from the Eureka signal and we are right at that period. This coming week is critical. The 200-dma has peaked and started to roll over. % B of the Bollinger Bands has broken down through the Bandwidth, again signaling weakness. Late Breaking News: My good friend, Mike Scott, reminds me “that the closer to the apex of the triangle that the market or stock gets the more likely to get a head fake…A short false move prior to the real move. This tends to sucker punch a lot of traders and those with stops placed close into the formation.” Next week will be interesting to see how this unfolds. 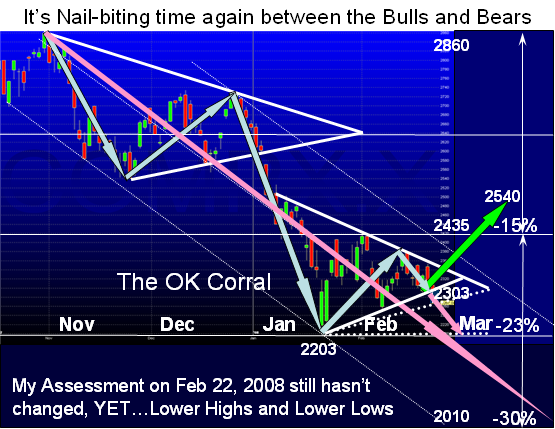 This entry was posted on Saturday, February 23rd, 2008 at 9:14 pm	and is filed under Market Analysis. You can follow any responses to this entry through the RSS 2.0 feed. Both comments and pings are currently closed.